In order to quickly move in this direction, Naga decided to hold its own token sale. And, to date they have raised almost $16 million out of the $20 million they were planning to raise in the sale. 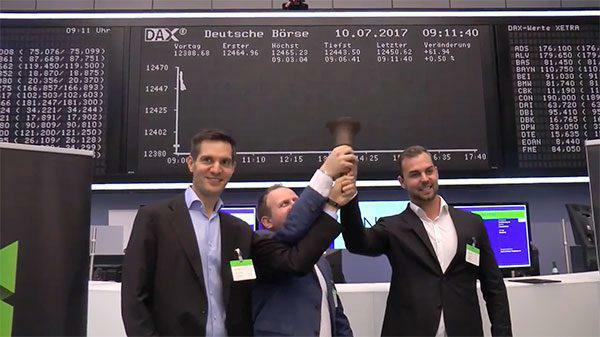 The IPO of the NAGA Group AG at the Frankfurt Stock Exchange, Germany, on July 10, 2017. NAGA’s founders Yasin Sebastian Qureshi, Christoph Brueck and Benjamin Bilski pictured left to right. (Photograph: Deutsche Boerse). The Naga Token will serve as the currency of Naga’s ecosystem that consists of a crypto wallet, a trading and investing platform, a virtual goods marketplace, and a financial education academy. Proceeds from the sale will be used to develop and commercialize these various services. As a VR platform that targets the entertainment industry and also founded in 2015, Ceek enables artists to create VR experiences for their fans and audiences. It has already worked with several industry giants and headlining acts to power VR events through their hardware and software. Currently the company is working on a VR event destination using blockchain technology, which will also provide artists and acts easy access to blockchain functionalities such as token and virtual merchandise creation. To accelerate that development, Ceek is set to run its token event through December 2017. In addition to raising capital, token sales also enable companies to encourage investors to become future users of these ecosystems. Some might simply consider tokens to be tradable assets on crypto exchanges. However, tokens can actually serve specific purposes in the context of the company’s products and services. Investing in such tokens essentially is comparable to getting early access to discounted store credits. In the case of Kik, its Kin token is a general-purpose cryptocurrency that can be used in chat, social media, and mobile payments. Further developments would also use Kin as a means to facilitate all financial and economic transactions on the platform. Like other cryptocurrencies, it is also tradeable over exchanges. It should be noted here that investing in cryptocoins or tokens is highly speculative and the market is largely unregulated. Anyone considering it should be prepared to lose their entire investment. For Naga, the Naga Token can be used by token holders to transact across its various services. For example, users would be able to spend the token on financial instruments on SwipeStox or trade virtual items on Switex. Utilizing the token would also allow users to receive bonuses and discounts compared to using fiat – traditional currencies. Ceek will also be using its own token to power its “entertainment metaverse.” Users can spend their tokens on Ceek’s Virtual Mint that would allow them to create their own virtual tokens, which can be then used as tickets to VR events and virtual items that could be traded as merchandise. Ceek will be running its own protocol, which is claimed to be cheaper to use compared to other blockchain platforms. Despite these benefits, there are various reasons why many established companies may be avoiding token sales. To start with, token sales require preparation and technical expertise. And, some may not be prepared to make such an investment. There is also the issue of perception. Token sales are now popularly associated with tech and blockchain start-ups. Others, especially non-tech organizations, may think that blockchain and crypto tokens are not relevant to their line of business. In addition, there is also a slight negative connotation associated with the activity especially in light of failed and fraudulent token sales. And the regulators in the U.S. and elsewhere have been casting eye over them. Some might even view established companies to be greedy if they attempt to secure additional funds in such a manner since they assume that the business should already take care of itself. However, token sales still fundamentally serve the purpose of traditional funding and public offerings and according to some industry folk should not be viewed as a “strange departure” from the practice. Additional capital can improve a company’s capabilities by leaps and bounds. But of course it requires being deployed correctly, just like blockchain technology itself, to reap benefits. Furthermore, token sales could actually be part of the company’s blockchain adoption strategy. In fact, early success could be a powerful differentiator to inspire investor confidence. Other token sales only have minimum viable products or even less to show. Ceek, for instance, has already developed the hardware and software that are central to their service. Companies might do well to investigate how blockchain can help take their business to the next level. Among its possible uses is for the creation of custom crypto tokens, which could be used to drive their product and services or used as alternative forms of store credit or rewards points. Many companies are not yet leveraging this use case, but the ability to put up significant capital without the associated burdens of a public offering or venture funding should not be overlooked. Having the resources to accelerate expansion could be the difference in thriving and surviving in today’s market.